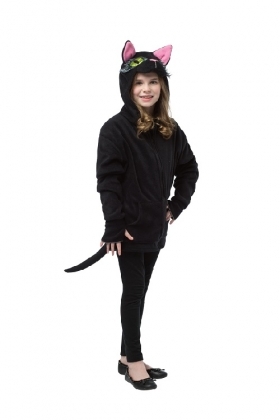 Made from cotton and polyester, this cat costume is both comfortable and cute. Featuring a front-zipper with attached cat tail, hood with big green cat eyes, a pink nose, and pink-lined ears! Teen 13-16 fits chest sizes up to 42 inches. Medium 7-10 fits chest sizes up to 36 inches.